Everyone knows you can’t score without shooting and knowing how to shoot is only a small part of being a successful contributor to your team’s overall success. Knowing instinctively where to shoot allows players to become complete goal scorers by decreasing decision time in highly competitive areas of the ice. Goalies are taught to play the angles and their position and depth within the net changes as the puck moves around the offensive zone. This concept can be applied to offence, allowing players to shoot with a purpose based on their position on the ice. 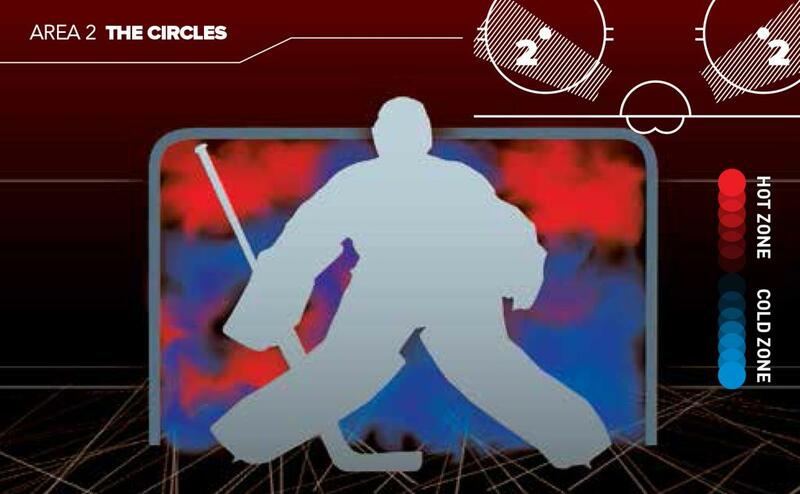 Knowing how the modern goaltender will be set up, let’s investigate four unique areas in the offensive zone. 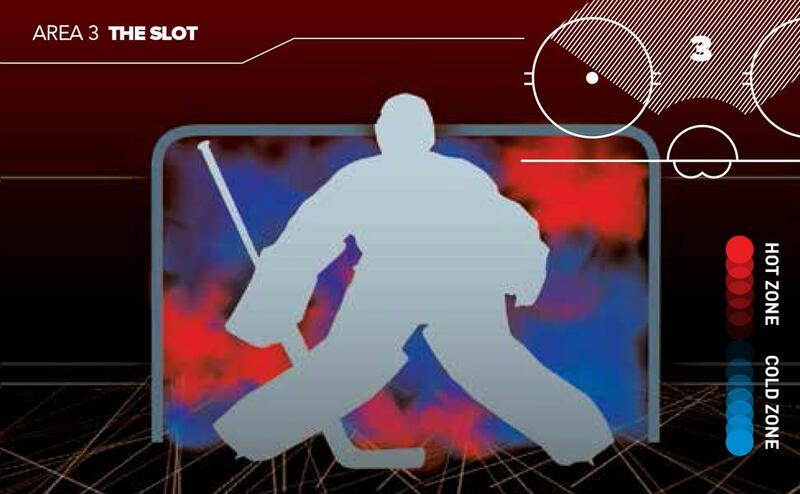 They have been identified based on angles and distance to the net in the hopes of identifying weaknesses in goaltending position to increase overall scoring efficiency. The area in front of the goalie is the most valuable real estate on the ice at both ends of the rink. A player’s ability to score in this high traffic area of the ice comes down to quick reactions. Getting the puck upstairs on both the forehand and backhand along with a willingness to attack the net in traffic can often be the difference in a game. Most goals scored in tight come in the form of reactionary chances including rebounds, deflections and dekes. More often than not, the goalie will be down and outstretched from making the first save so aiming for the upper third of the net will significantly increase the chance of scoring. Players will need to read the angle, the rebound will likely come off the goalie and be in a ready position to one-touch the puck into the net. It is crucial to a player’s success in this battle zone to have their stick on the ice so that they can get shots off the moment it touches the stick. If a player finds themselves in tight and alone, the goalie has the percentages in their favour to cut down all angles. Sell the goalie with a quick deke, opening the blade or slight drop of the shoulder in the hopes that it causes the goalie to commit to block a specific area. Once the goalie has committed, the bottom of the net will likely be taken away which leaves the shooter to the upper parts of the net. Many of the great players in the game have made a living by scoring on the outside of the dots, however scoring from this area requires good puck placement, power and a quick release shot. There are a few different situations where these scoring chances will occur: a one-timer on a power play, a cycle walkout from the corner or half wall and an offensive rush where the player has been forced outside the dots by the opposing defender. On a man advantage, the most effective shot from this area is a one-timer. Getting the puck off quickly with power is the key to beating the goalie as they slide across their crease in a vulnerable defensive position following the pass. Players in this area need to be ready to release the puck quickly to prevent the goalie from getting into proper position to cut down the small scoring angle. 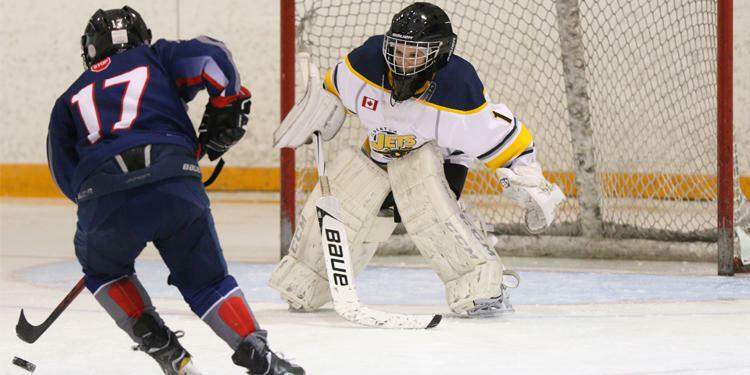 The goalie will likely be fast enough to cover the short side of the net so players should look to aim far post to score or generate a favourable rebound for teammates to capitalize on. Scoring off the cycle out of the corner or off the wall is less about power and more about the quick release. Scoring chances in this area are created once a player gains a step on the defender and has space to safely move the hands away from the body to generate a powerful and quick shot in stride. This is not an easy skill to master but will allow players to catch the goalie off guard and the element of surprise can increase the likelihood of scoring. Deciding what shot will work best off the rush requires players to determine how much gap the opposing defenceman is giving. If the defenceman’s gap is tight, time to get off a shot is limited, so a hard well placed snap shot is often the best option. If the defenceman’s gap is loose, it allows enough time to lean into a slap shot. Looking off the far side, much like a football quarterback disguises a pass, can cause the goalie to commit to an angle too soon. In this zone, looking far side will open up a short side high shot to find the top corner. Alternatively, butterfly goalies have the most difficultly stopping shots low blocker. 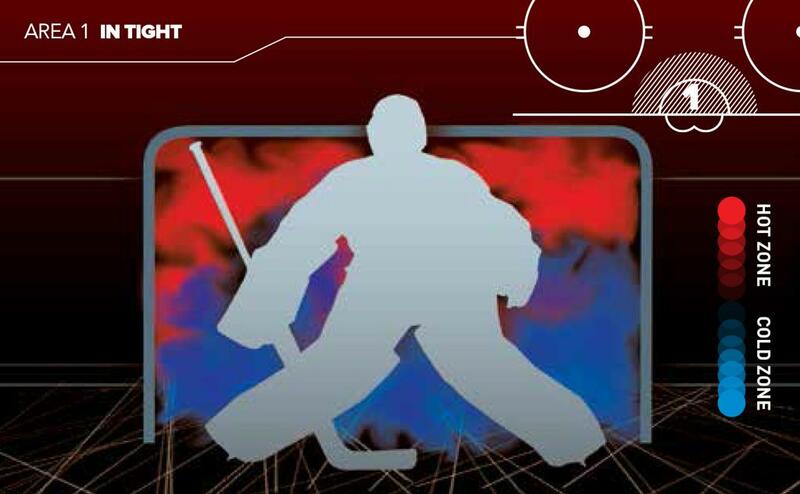 Inside the post, 12 to 18 inches off the ice, above the goalie’s pad is the most difficult shot for a goalie to stop. The slot is the place to be in the offensive zone with the puck on your stick and provides the greatest opportunity to score for the shooter. Defenders will try to clog and close down space in this zone because it is the most dangerous. Again, a quick release wrist shot or snap shot are the best options in this zone. This area of this ice is one where the angle is to the player’s advantage against a butterfly style goalie. The best areas to shoot for are high glove side and low blocker side. Over-stickhandling the puck or “dusting it off” only allows the opposing players, including the goaltender, to take away time and space so a catch and release shot is the best way to score from the slot. 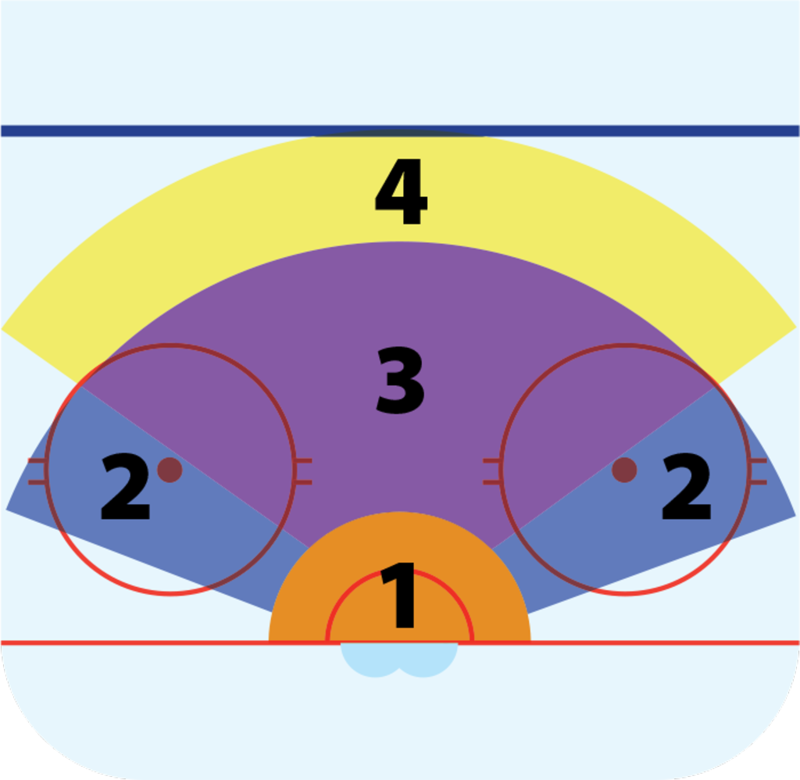 Moving horizontally across the slot with the puck will expose the five-hole. This movement also forces the goalie to change their angle which could expose holes to shoot at. Scoring chances at the entry point of the offensive zone generally come from shots by defencemen but situations can place forwards in this zone as well. Shots from the point have to get through a number of players from both teams so walking off the wall and moving laterally along the blue line to find an open shooting lane is essential. Time and spatial awareness are essential factors in scoring in this low percentage scoring area. Decisions on shot type are determined by both of these factors but the goal of any shot in this zone is getting the puck through traffic and on net. A hard, low slap shot is a great option for scoring but is also useful for teammates to deflect or collect a rebound opportunity. A middle to high net snap shot is another great option where the goalie can easily lose sight of the puck. The quick release makes it a difficult shot for the defenders to block. A drag and shoot technique or simply walking the blue line is a great way to open up lanes and allow teammates to better position themselves for a deflection or rebound opportunity. With today’s goalies being more athletic, and wearing larger equipment than in the past, shooters have to squeeze the puck through smaller gaps—which are likely to close faster than ever before. 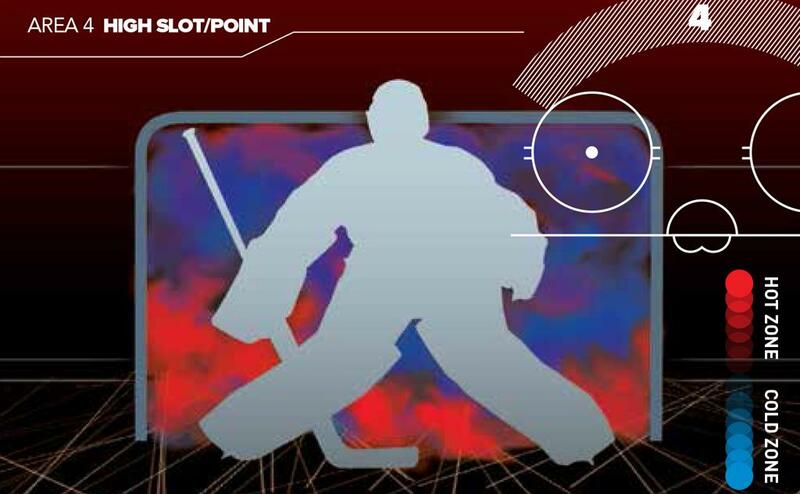 The split second it takes to determine where to shoot can be the difference a goalie needs to move into position. Practicing these different scenarios and aiming to specific parts of the net in practice will go a long way to putting more pucks behind the goalie. Brendan Taylor is an Oakville native who played three seasons in the Ontario Hockey League with Peterborough, Belleville and Saginaw. He is an Assistant Coach with the Mississauga Steelheads and previously served as the team's Video Coach.